The primary goal of the Central New York Regional Planning and Development Board’s (CNY RPDB) Economic Development program is to support the growth of a diverse economic base that will provide a range of employment opportunities for citizens across the five-county region. To support economic growth in Central New York, the CNY RPDB administers a numbers of programs including project development work, business assistance and finance, regional marketing, and planning and research studies. The CNY RPDB’s project development efforts include advancing public works, institutional, commercial, and industrial initiatives that will support the retention and creation of jobs and economic growth in Central New York. Specific activities include feasibility analyses, development of plans, preparation of applications for financing, administration of grants, and project management services. 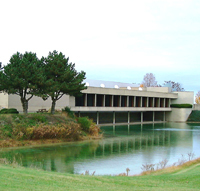 A sampling of projects that the CNY RPDB has worked on in Central New York include: Auburn Technology Park, Cayuga County-Auburn/Weedsport Water Transmission Line, Finger Lakes East Business Park, Trush Business Park, Canastota Industrial Park, Solvay Industrial Area Infrastructure Improvements, CNY Regional Market, Syracuse University Research Park, Onondaga Community College Applied Technology Center, Syracuse Technology Garden, Syracuse Lakefront-Solar Street Reconstruction, Hancock Airpark, Oswego County Industrial Park, Fulton Storm Sewer Improvements, and the Oswego Mitchell Street Sewer Improvements. Projects currently receiving agency attention include: the Aurelius Business Park, Madison County Agriculture and Renewable Energy Park, Clay Business Park, Syracuse Inner Harbor, and the Port of Oswego. The Central New York Enterprise Development Fund (CNY EDF) is a regionally-based small business loan program established by the CNY RPDB in 1988. 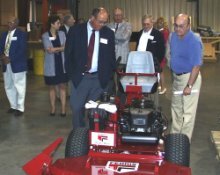 Since the program’s inception, the agency has closed on 120 loans valued at more than $6 million to small manufacturing companies and producer-service firms in Central New York. Loans from this program can be used to improve real property, purchase capital equipment, and to fund permanent working capital needs. The CNY EDF has a maximum loan amount of $100,000, which can be no more than 50 percent of the total project cost, and a 10 percent equity investment in the project is required by the borrower. Loans are secured by appropriate collateral and the personal guarantee of the borrower. The CNY EDF can be used in partnership with commercial bank financing, other public sector loans and grants, and private equity. The CNY EDF is administered in cooperation with the Central New York Enterprise Development Corporation, a non-profit corporation that is affiliated with the CNY RPDB. Funds used to capitalize the CNY EDF have been provided by the U.S. Economic Development Administration, U.S. Department of Agriculture, U.S. Department of Energy, NYS Empire State Development Corporation, NYS Energy Research and Development Authority, and local industrial development agencies in Cayuga, Cortland, Madison, Onondaga, and Oswego Counties. If you wish to file a Civil Rights program complaint of discrimination, complete the USDA Program Discrimination Complaint Form, AD-3027, found online at http://www.ascr.usda.gov/complaint_filing_cust.html, or at any USDA office, or call (866) 632-9992 to request the form. You may also write a letter containing all of the information requested in the form. Send your completed complaint form or letter to us by mail at U.S. Department of Agriculture, Director, Office of the Assistant Secretary for Civil Rights, 1400 Independence Avenue, S.W., Washington, D.C. 20250-9410, by fax (202) 690-7442 or email at program.intake@usda.gov. As part of the CNY Enterprise Development Fund, the CNY RPDB capitalized a new loan program in 2012 called the CNY Energy Efficiency Loan Program (CNY EELP) with funding obtained through the U.S. Department of Energy and NYSERDA. Loans from this program can be used by small businesses to undertake projects designed to improve the energy performance of their facilities and production processes. Loans may be used to help finance projects within non-residential or mixed-use buildings owned and operated by the borrower. To be eligible for assistance, projects must be consistent with various energy efficiency incentive standards that have been established by NYSERDA and/or local utility companies operating in Central New York. The maximum loan amount that can be provided through this program is $100,000, which can be no more than 50 percent of the total project cost, and a 10 percent equity investment in the project is required from the borrower. Loans are secured by appropriate collateral and the personal guarantee of the borrower. For more information, please e-mail Michael Rosanio or call 422-8276 x205. As part of the CNY Enterprise Development Fund, the CNY RPDB capitalized a new loan program in 2012 called the CNY Rural Microenterprise Assistance Program (CNY RMAP) with funding provided by the U.S. Department of Agriculture – Rural Development. The CNY RPDB, in collaboration with the Small Business Development Center at Onondaga Community College (SBDC), has developed a technical assistance and lending component to the CNY RMAP program that is designed to support rural entrepreneurs that generate employment opportunities, encourage investment, and support sustainable development in their communities. The program targets a range of businesses whose activities constitute an “essential core” of economic activity in their community with the long-term capacity to sustain itself in a rural environment. Examples include businesses that produce value-added products from local raw materials, that serve a community’s basic needs, that provide essential business-to-business services, encourage tourism development, or that support the community’s rural identity. Eligible businesses must be located in a rural area within the CNY RPDB’s five-county service area. Businesses can take any legal form and can employ no more than 10 full-time workers at the time of application. The CNY RMAP pursues a two-pronged approach to assisting rural entrepreneurs by providing entrepreneurs with both the technical and financial tools necessary to successfully operate a small business. Applicants must complete a minimum of 10 hours of technical business training through a combination of NYS SBDC coursework and one-on-one counseling prior to receiving loans through the program. Loans may be used to acquire or improve real property, to purchase capital equipment or to fund permanent working capital needs. Loan amounts can range up to $50,000, which can be no more than 75 percent of the total project cost, and a 10 percent equity investment in the project is required from the borrower. Loans are secured by appropriate collateral and the personal guarantee of the borrower. The CNY RPDB is actively working with local economic development organizations to support a regional marketing and business recruitment program. Program activities supported by the agency include the development of a regional site profile database, publication of a regional marketing brochure, developing relationships with national site location consultant and corporate real estate executives, and assisting with regional business and site familiarization tours of Central New York. The CNY RPDB commissioned the preparation of this report in June 2013 through a consultant contract with Barton & Loguidice, P.C. Funding for this initiative was provided by the U.S. Department of Commerce – Economic Development Administration and National Grid. The sites incorporated into this database where chosen by the CNY RPDB in consultation with local economic development officials in Central New York. Selected sites and development areas consist of a minimum of 50 acres and generally have the necessary zoning and infrastructure services in place to support major development projects in the region. This database is not a comprehensive listing of all commercial real estate development opportunities in CNY. View the Central New York Regional Site Profile Database. As part of its comprehensive regional planning program, the CNY RPDB prepares an annual update to the CNY Comprehensive Economic Development Strategy (CNY CEDS) as part of its work as the federally designated Economic Development District for Central New York. 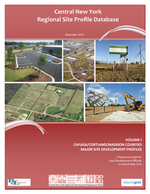 This plan serves as a guide for the agency’s economic development work in Cayuga, Cortland, Madison, Onondaga, and Oswego Counties and provides a vehicle for local, state, and federal officials to identify key projects that should be undertaken in Central New York to support economic growth in the region. In addition to its work on the CNY Comprehensive Economic Development Strategy, the CNY RPDB conducts on a periodic basis special planning and research projects to support economic development efforts in Central New York. Studies which have been completed by the agency recently include an inventory of telecommunication resources in Central New York, an analysis of higher education resources in Upstate New York, a reuse plan for the former Carrier manufacturing site in the Town of Dewitt, and a community master plan for St. Joseph’s Hospital and a proposed Prospect Hill Medical District in the City of Syracuse. Studies currently underway include a strategic economic development plan for Madison County, development of a regional site profile database, and completion of a conceptual master plan for modern intermodal rail freight facility in Central New York. 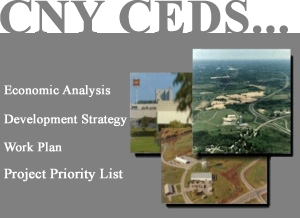 View the Central New York Initiative - A Comprehensive Economic Development Strategy for Central New York, June 2015.